← Please Light the Elephant Dung! Imagine that your friends in Paris have just sent you an enormous stuffed envelope. You open it and out spills candid photos, a collection of lists and short essays. There are even a few recipes. Your friends want you to know how a Parisian woman thinks. They want to make you laugh at their outrageousness. And sneak in many words of encouragement to love your imperfect self. 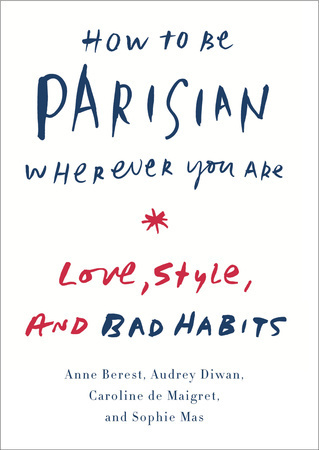 This compilation of information is the new book, How to be a Parisian wherever you are * Love, Style and Bad Habits. On nearly every page there is something so true and amusing, that by the end, I was certain that I was at least in some part Parisian myself. Voila, the secret of the Parisienne. Her love of love. This is a fabulous hodgepodge of advice on relationships, being a woman, and living the good life in Paris. But these gals, are talking about living life in 5 inch heels (but loving men’s shoes) and taking lovers and occasionally staying out all night. The four friends/authors are in their 30’s. One of the four authors and friends, is Caroline de Maigret, a model I recognized from a campaign she did last year for Madewell. Beyond being a model, she is also a music producer with her own music label and a mother. The other friends are novelists, editors, and film makers. These Parisians are intellectual party gals. There is a lot about bad habits in this book. I read that the authors wrote this in some part as a reaction to other books where it seems Parisian women get everything right. The authors said that they enjoyed writing about their flaws in parenting, about being snobs, about being cold sometimes. They want us also to own our bad habits. As a caution, this is not like the other books in my library on how to be chic or how French women don’t gain weight. It doesn’t explain how these women do their daily lives. This is more how French women do Paris. For instance, you will get the familiar advice to “be prepared always.” Except that in this book it is delivered like this. Always be F**kable:when standing in line at the bakery on a Sunday morning, buying champagne in the middle of the night, or even picking up the kids up from school. You never know. Another section gives you the ABC’s of cheating on your boyfriend but also A Mother’s advice on Love. So it is entertaining to read but also great to read. You’ll read short fictions called The Party and 1:00 PM, First date at the Cafe de Flore. There are photos tucked in of what is in their handbags, and photos of friends. In one part they talk about how important friends are. They’ll get pregnant at the same time, perhaps because they can’t actually have children with each other. Honestly, there is even a list of addresses of places to go with a Hangover or to find a Garden in the City and a few recipes on what to cook when you have a dinner party. On fashion, there is less in here than in a book like Ines de la Fressange’s Parisian Chic. They offer a guide on… how to take care of yourself while giving the impression that you don’t take care of yourself. The categories they touch on are Hair, Skin, Hands/Feet, and Plastic Surgery. If you want to know more in-depth about these topics, you must get Forever Chic by Tish Jett. You will find a section called Trinkets and Treasures on how the Parisienne wears jewelry. There is a section on wearing Navy blue, which is also an essay on how Serge Gainsbourg wrote a song for Isabelle Adjani that influenced Parisian girls desire to wear Navy. You will get a list of the books on the Parisienne’s bookshelf and a list on what films to see that bring Paris alive on the screen. And there is this one about writing: The Parisienne doesn’t keep a diary nor does she confide her innermost thoughts to an imaginary friend. … However, every Parisienne has a notebook in her purse, preferably a black Moleskine, in which she’s constantly jotting down all sorts of things. On friendships: Without her girls gang, the Parisienne is incomplete. Thankfully, from this girls gang has come a most clever and playful book to take us a little bit closer to understanding what makes the Parisienne and Paris so wildly alluring. This entry was posted in Book Reviews, For Fun, Janis Wildy about writing, Janis Wildy book reviews, Macarons and books for Francophiles and tagged Anne Berest, Audrey Diwan, Books of living in France, Books on Paris, Caroline de Maigret, Francophile, french style, Girlfriends Paris, How to be Parisian wherever you are, How to look French, ines de la fressange, Looking French, Paris, Parisian Chic, Reading Paris, Sophie Mas, where to go in Paris. Bookmark the permalink. Do you do book reviews? I have recently published my new book entitled, ‘In Search of Piétons’ and I would be most grateful if you would be willing to provide a review on this non-fiction travel photo documentary book which took place in France.